Today is World Health Day, which this year under the slogan, From Farm to Plate, Make Food Safe highlights the issue of food safety. Foodborne illnesses, like E.coli and Salmonella, are caused by consuming foods contaminated with viruses, bacteria and other microorganisms. The World Health Organization (WHO) reported an estimated 582 million cases globally of foodborne diseases in 2010 and 351,000 deaths as a result. 40% of those affected were under 5 years. WHO also noted the substantial economic costs of unsafe foods – Germanys 2011 E.coli outbreak resulted in US$1.3 billion in losses for farmers and industry. Food safety underlies food security. Individuals have a high degree of control by practicing safe food hygiene when buying, preparing, and storing foods. With a highly globalized food supply however, food safety is equally the responsibility of suppliers, manufacturers and distributors, and cuts across public health sectors, agriculture, trade, environment and commerce. WHO is working to ensure adequate, safe and nutritious food access for all and is explicit in its call for cross-border and cross-sector action across the global food supply chain to achieve this. Greater cross-sector collaboration is a key recommendation from the Vitality Institutes Commission on Health Promotion and the Prevention of Chronic Disease in Working-Age Americans, and a theme increasingly recognized as vital to progress the health of the nation. The Food and Drug Administration (FDA) has strongly supported the Global Food Safety Partnership, whose role is to strengthen food safety systems and global supply chains through the collective cooperation of government, industry, consumers, academics and international organizations. 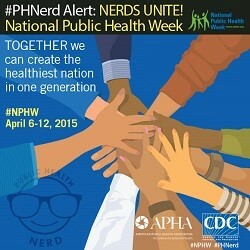 This week the US also celebrates National Public Health Week, championing the goal of creating the healthiest nation by 2030. Building broader connections is Thursdays theme, calling for expanded partnerships with city planners, education officials, and public, private and for-profit organizations to achieve this ambitious goal. Furthermore, next week the Chicago Council on Global Affairs will launch its global food symposium: Healthy Food for a Healthy World: Leveraging Agriculture and Food to Improve Global Nutrition. This will build further on the benefits of collaborating across sectors and will examine the role of agriculture and food systems in promoting health and alleviating malnutrition. And in summer, a Lancet-Rockefeller Commission Report on Planetary Health will add its voice to the mix. Working together to ensure safe, nutritious and sustainable food systems? An idea clearly worthy of ongoing promotion.